Ainavilli is located at a distance of 72 Km from Kakinada (Via Yanam, Amalapuram and Mukteswaram), 55 Km from Rajahmundry (Via Ravulapalem, Kotapeta and Vanapalli) and 14 Kms from Amalapuram (Mukteswaram). According to Vaastu Sastra the most suitable places to build temples are, on the bank of a river, near the sea - shore, at the confluence of riv ers, on top of a mountain or near places of sanctity. In the midst of the lush - green fields of the River Godavari the Konaseema area reminds one of the sanctity and sacred feeling described in the Vaastu Sastra. In this area of Konaseema is AINAVILLI, where the "SIDDI VINAYAKA TEMPLE" is situated. 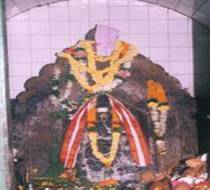 Before performing Daksha Yagna Daksha Prajapati was supposed to have performed puja of Vinayaka at this place for its successful completion. This is written in the "KSHETRA PURANA" of this place. There is another story that Vyasa Maharshi, during the beginning of his tour of the South, had installed the Son of Parvati at this place and this age - old "SIDDI VINAYAKA" is reputed to fulfill the wishes of his devotees. In a spacious, elevated area, this temple of Vinayaka stands with idol facing South. 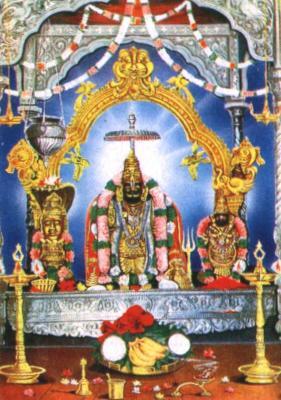 With two gopurams and gates, one can approach Vinayaka from the south and Sri Visveswara Swamy from the East. In the same compound is situated Sri Devi, Bhudevi with Sri Kesava Swamy. By the side are situated Sri Annnapurna Devi. 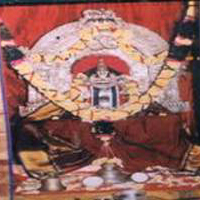 Sri Kalabhairava Swamy and Kshetrapalaka are situated by the side. According to Saivagama, every day archanas are performed. Abhisheka is done regularly according to sastra. Thousands of people from far - off places throng the temple to worship Siddi Vinayaka, who fulfills the wishes of his devotees quickly, directly. Devotees worship at the shrine of Ganapathi, placed in the midst of coconut gardens, the green fields and natural surroundings. Devotees take a vow to visit the temple to get their wishes fulfilled it is the belief and practice of the people of this area to make a promise in the name of this God. Adurru is located near Nagaram in Razole taluk of East Godavari district. The village lies on the west bank of the Vainetaya, a branch of Godavari river 9.5 km. from the sea. The mound is locally known as Dubaraju Gudi. Archaeological Survey of India conducted excarations in 1953 and brought to light, remains of stupas, chaityas and vinaras among which the Mahastupa, built on wheel shaped plan 17 feet in diameter with a raised platform running all round the drum and ayaka platforms on cardinal directions. The Buddhist remnants spread accross an area of approximately 2.04 acres. Sage Vasista, after mingling the Goutami branch of the Godavari into the Sea, established his Ashram there. Lord Brahma, to get freed from the sins he had committed against Lord Sankara, performed Rudrayaga and installed Lord Neela kantheswara there. As that place was made a stage or "Vedik" to perform the Yaga, it was named as "ANTARVEDI". It is the place between the Vasishta river. After some time, Raktavilochana, the son of Hiranyaksha, did tremendous penance for ten thousand years on the banks of Vasishta river, to please Lord Siva and to get his grace. Lord sankara was very much pleased with his penance and appeared before him. He promised to bless him with Whatever he would desire. Raktavilochana asked him that the number of sand particles drenched by the blood drops falling from his body on to the ground at war, would produce equal number of Rakshasas as strong and vigorous as himself after and they would assist him at war and become one with him after killing all the enemies. Lord Sankara was astonished at the demon's uncommon desire, but as per the promise, being impressed of his penance had concerned to his desire. Then the rakshasas pride know no bounds. He started harassing the brahmins, the Gods, the saints and the cows and obstructed Yagas and Vedic-recitals. Sage Viswamitra found opportunity to take Vengeance against sage Vasishta and provoke Rakta-vilochana to kill Vasishta's hundred sons in his absence. The Demon did so, causing an irreparable loss to Arundhati and Vasishta. Arundhati, Vasishta's wife, wept a lot for the death of her son and prayed to Vasishta who was then at Brahmaloka. The sage by his divine vision, could come to know of what all happened at this hermitage. He returned to his ashram and prayed for Lord Narasmiha's grace. "Prahlada varadam Vishnum Nrusimham Paradivatam. Saranam Sarvalokaanaamaapannaarti Nivaaranam." Then to save his devotees, Lord Nrusimha along with Goddess Lakshmi, Charioted on Garuda Vahana and appeared before Vasishta. Vasishta after singing his glory, appealed about the arrogance of the demon and his cruelty in killing his sons. He then prayed to the Lord to descend at his ashram, after killing the demon, so that he would worship him always. Lord Narahari blow the 'Panchajanya' inviting the demon to the war. Raktavilochana heard the thundering noise of the panchajanya and like a cyclone enveloped the Lord and engulfed him to fight with him. He shot all types of weapons at the Lord. Lord Narahari could attack and smash them with his only weapon the 'Sudarsana' the chakrayudh wounded the sensitive parts of the demon's body. As a result of which blood-shed took place. The soil particles drenched by the blood drops falling on to the ground from his body, produced equal number of demons as strong and vigorous as Raktavilochana. Demons having been thus generated, began hurting garuda who attached them in such a way that they could not with stand him. The demon-king saw this and throw his weapons one after another at Garuda which could not do any thing against him, as Lord Narahari destroyed them on the way with his Sudarana Chakrayudha. In addition to that he created "Maya Sakthi" to manage stopping the fall of blood drops from Rakta Viliochana body to the ground. At last, after a tough fight with the demon, Lord Narahari killed by cutting his hand with chakrayudha, with the same Sudharsana chakra, he killed the demons also. Then the blood stopped by Maya Sakthi from falling on to the ground, was released by her as a reddish river, know as the "Raktakulya". This river can't be passed over even Bhetala and the devils. Maya sakti rode a horse, and so called as 'Aswarudhamba' or 'Gurralakka'. The place where the Lord after killing the demons washed his chakrayudha, become popular as chakrateertham. A dip at the place washed away all the sins. When the Lord wiped of the troubling demon, Vasishta expressed his desire of establishing his Holiness at his hermitage. The Lord was pleased to agree to fulfill his desire. Sage vasishta on an auspicious day, in the Presence of all Gods and angels with all Vedic formalities, erected Lord Narahari at Antaravedi all of them said their prayers to the Lord and sang his glory. Then the Lord told them about the significant greatness of the shrine in future. He described Antarvedi in many ways as the easiest means for achieving the ultimate Mukti. Ruchi was much worried about this.Lord Narahari appeared to him in dream and advised him to keep the flowery remnants of worship of the temple around the garden. He did so on the next day. As usual, Indra's son descended on to the earth in his chariot, he could not find them there, as he lost his divinity by passing over the flowery-remnants. Then his driver told him the cause for it. He at his master's request, before returning to the Heaven, also advised him to perform Mahasatrayaga for twelve years and to eat the food left over after being tasted by the Brahmins. Indra's son did so the Brahmins Learned from him about the purpose of doing so and blessed him. Then he regained his divinity and returned to the Heaven, ascending his divine chariot. Santhana was adivsed by Narada to follow Indra's son also did so at Antarvedi and regained divinity. For some time after commencement of Kaliyuga, Antervedi was a Jungle where kesavadas, a cow-herd used to graze his cows daily. A reddish brown cow of the herd to go lonely in the jungle and used to shed her milk on the hill behind a bush. On her returning home, Kesavadas was not given milk by the cow. One day he watchfully followed that cow and astonished to see the scene that was daily happening. He could not get sleep that night. At last when he could some how merge himself in to sleep, Lord Narahari appeared on him in dream and said to him to build a temple for him there. The next morning kesavadas told this to the Villagers. A brahmin scholar of the village, who had a sound knowledge of the sastras, could guess the God appeared to kesavadas in dream to be Lord Narasimha who was once erected and worshipped. By the sage vasishta. The Villagers made a survey of the ant-hill area, where the cow daily used to shed her milk, and dug the area after offering coconuts to the Lord. They found a stony sculptured form of the Lord Narasimha. They build a temple there and that place become one of the most popular shrines in the later ages. The daily rituals and annual fair have been conducted since then. The village where kesavadas lived is named after him as 'kesavadasupalem'. 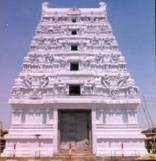 This temple is located at a distance of 33 Km from Kakinada, 40 Km from Rajahmundry and 60 Km from Amalapuram. Biccavolu is known for Beautiful stone temple of Lord Shiva. Built by the Eastern Chalukyas in the 9th-10th centuries, the temples are a fine example of the architectural grandeur that was typical of the Dravidian style. A stone sculpture of Ganesha in the village is a masterpiece of Chalukyan craftsmanship. The name of the village Biccavole derived from the ruler to Turupu Chalakya Vamsam during their period 849-892 BC and the rulers constructed number of important temples during their period around the Biccavole village. Out of which one of the temple, Sri Raja Rajeswari vari temple and Sri Chandrasekhara Swamyvari temple. They are very prominent with great Silpakala nypunyam. Annavaram is in the Chennai to Howrah main railway line. Annavaram is situated 32 Km from Pithapuram, 51 Km from Kakinada and 85 Km from Rajahmundry. 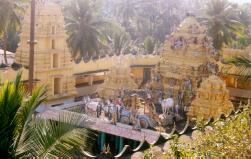 It is famous for Lord Veera Venkata Satya Narayana Swamy temple, situated atop the Ratnagiri Hills on the banks of the river Pampa. 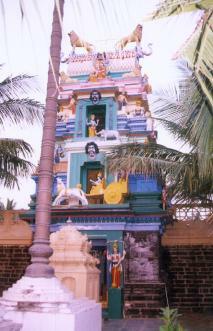 One of the most popular temples in Andhra Pradesh, a unique Yanthra based on Tripad Vibhuti Narayan Upanishad exists here. The shrine is constructed in two storey, the lower one containing the Yantra and upper one housing vigrahas of the Lord.The idol which is about 4 metres high is in cylindrical form.The base in the lower sanctum represents Lord Vishnu and the middle portion represents Lord Shiva. The image of the deity forming a single idol and representing the Hindu Trinity is of unique attraction.